Synopsis: Guaranteed to be incredible, fantastical and the ultimate page-turner, this final title in The Last Dragon Chronicles brings together the amazing characters and wonderful worlds that Chris d'Lacey has drawn on throughout the series - in one stunning finale. Before the secrets of the tapestry of the battle of Isenfier can be discovered, first, we must tell of the legendary Agawin, a young boy in the prehistory of time, when dragons still roamed this earth in all their magnificence. He shall tell of the quest for the last dragon, Galen, and his guard high up the mountain peaks of Kasgerden, ready to shed his fire tear and return his auma to the eternal fire of Gaia. But before even that comes his battle with Voss, the evil, Ix-infested premen…not all shall be well. The Last Dragon Chonicles have come a long way from the innocent, mundane tales of The Fire Within, when we first meet David Rain and the Pennykettle family. 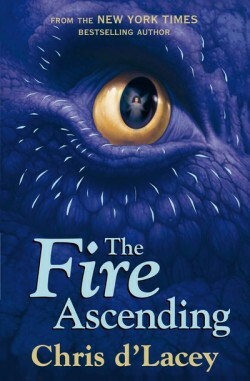 Perhaps more than any other series, d’Lacey’s creativity can be traced and followed from the humble beginnings of a childrens’ story to an epic, universal struggle for survival in the later novels- and this, potentially, is The Fire Ascending‘s greatest strength as it closes just over 10 years of publication of the Dragon novels. As always when there is a change of direction in story telling, some readers might be disappointed by the continuation of the “epic” storyline that started, arguably, in Fire Star. For myself and I suspect many others, the characters of Liz, Lucy, David and Zanna are what made the series and brought the novels to life; their undiluted eccentricity that borders on hilarity as well as their escapist “fantasies” of dragons. Whilst they do reappear in that lovely form, it is but a moment, though melancholy and rather fitting as their farewell. Unlike Fire World, which could (and has) been seen to stand alone as its own novel, The Fire Ascending ties together the narratives that weave in and out of each other in the Last Dragon Chronicles, and as such, can only really be understood when all of the previous novels have been read. In that light, I will not even attempt to introduce the novel other than to say that it follows the battle of Isenfier and Agawin, as well as Rosa and the destiny of Co:pern:ica, all of those terms you will understand if you have read the previous novels (which you should- I highly recommend it). And on that note, I will hold my tongue and let The Fire Ascending speak for itself: thank you, Chris d’Lacey, for writing these novels. What did you think about The Fire Ascending? No, don’t worry, they do make an appearance, particularly towards the end! It’s a rather lovely conclusion. I was rather disappointed with The Fire Ascending. While I accepted Fire World as an abridging novel to tie up some of the looser points, I wasn’t particularly happy that the original characters had such a small part. It was these characters that really made the story, and without them the rest of the universal significance isn’t very interesting. I know what you mean, though in my opinion the ending where we return to the Pennykettles makes it all worth it. But I see your point- it would have been nice to see MORE of the Pennykettles, but then, it’s always nice to see more of them! I loved this series so heres my mini review for it: The Fire within was a little dissapointing for me because I thought it was mostly about squirrels and other things that were NOT dragons. Icefire was better and revealed a little more of the plot.Fire star was where it started to get me thinking and I just love how chris brought in new elements for this book!The Fire eternal was very good but not one of my favorites although it was interesting to meet arthur and everyone else 5 years after Fire Star. Dark Fire was my favorite because I loved the shockers and the whole plotline and the ending had me baffled for days which I loved. Fire World I loved seeing the characters taking on a whole new life and learning more about The fain and stuff. The Fire Ascending was amazing! You meet tons of new characters including agawin and voss and you learn the ancestry of dragons and of the world! The final battle was just amazing and finding out that zookie stopped time when I thought he restarted the world put my confusement about dark fire to rest. This was an amazing book to tie up the series. I give it 5 stars! It’s a great ending and everybody loved it, I did and I’m only 13. It’s sad but suiting. What do you like about the series, Gabriel?